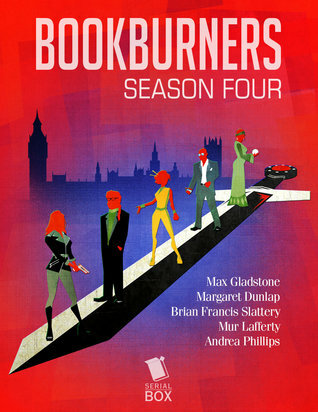 Bookburners: “The Blood-Dimmed Tide” by Mur Lafferty. Season four: episode 2. This week’s Bookburners‘ episode picks up where the last one left off… quit reading now if you don’t want spoilers! I believe that a good sequel should expand the story — both the relationships between characters as well as the world itself. That goes as well for serials such as Bookburners. I don’t expect each episode to do this (they’re kind of short for that! ), but for such expansions to happen over the course of the season. Yet, “The Blood-Dimmed Tide” managed to do both within a single episode. Let’s start with world. Obviously, everything’s shaken up by the death of You Know Who in last episode. This involves the grief and confusion you would expect, as well as re-introducing an old antagonist and putting the hopes of a grand, “save the world” team up to rest. But “The Blood-Dimmed Tide” brings it into a direction I didn’t expect: the episode opens with a lawyer working for a firm specializing in estate management. Magical estate management. Okay, I should have expected this from a story Max Gladstone’s involved with, but it still makes me grin. Magical estate lawyers! That’s probably a whole new serial right there. Anyway, the focus here is still on Team Three, but now they’re discovering that they’re all beneficiaries in the deceased’s will. Yes, even Liam. It’s a really cool concept that shows you an entirely different side of the magical community. Plus, it also does some handy plot work. Those inheritances? Sure to become plot significant and some point, even if they seem useless now. I thought it was a really fun move on Bookburners part, and I’m sort of hoping we get to see more of the magical estate lawyers! As for character development… wow, is there a lot going on here. For one, Ashanti’s a huge mess. That’s probably to be expected, but “messy” and “magical” isn’t a good combo. When people try to point this out to her, she gets super bristly. Also, she wants revenge. Ashanti’s always been headstrong and willing to go against other’s opinions to forge her own path. The others obviously want to go after the murderer, they just want to do so cautiously. I’m not 100% convinced Ashanti won’t go off on her own vengeance quest at some point. However, the big change here is that Menchú is stepping back from a leadership role. We saw hints of this in the previous episode, with him feeling helpless to provide the team with any sort of reassurance when he himself is so at sea. As Grace says, Menchú’s pillars have always been God and the Church. Now he’s lost one of those, and he’s drifting. The other team members have started to notice, and it’s making everyone uneasy. Sure, there’s a world in peril and weird magic and demons, but isn’t the characters what keep us reading? I want to see if Team Three manages to save the day, but I also want to see if they’ll still be the same people once it’s all over. I suspect they won’t be.